Choking is common in young children and it is one of the causes of unintentional death among children. Their smaller airways and windpipe put them at risk of choking. In choking, the obstructed airway or windpipe will prevent oxygen from reaching the lungs and subsequently brain. This can cause death. Any small objects can potentially cause choking. These include foods, house hold items and toy pieces. What does a choking episode look like? Infection of the lung i.e. pneumonia. Death from severe pneumonia or inflammation of the lungs or lack of oxygen to the brain. What to do if your child chokes? Wait for the child to cough. Open mouth very gently – remove object only if you see it clearly. If unsuccessful, slap the infant firmly 5 times between the shoulder blades with the heel of your hand and the child’s head held lower than the body. Do not sweep your finger blindly into the child’s mouth. Do not pull the neck backwards. If the infant stops breathing and remains blue or unconscious, start Cardio-Pulmonary Resuscitation (CPR) while waiting for expert help. Make the child stand if conscious. If child is unconscious : Perform CPR. Do not allow your child to eat while they are playing. Prepare the food into bite size pieces. Keep floors, tables and areas where the child plays free of small objects. 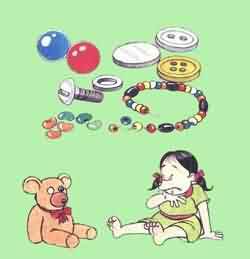 Eg : buttons, marbles, coins, pins and beads. Avoid giving foods that can easily cause choking such as peanuts, candy and pop corn. Avoid giving toys with small parts. Learn first aid on how and what to do if your child is choked.